Today’s lovely picture for the February challenge comes from Elaine. By the way, Elaine is a talented nature watcher and photographer with a blog of her own: A Scattering. Below is a link to your animated gif. As you may recall, animated gifs cannot contain sound. Hope you’re having a great week. I’ll see you tomorrow! This entry was posted in Animated GIFs, Flash, Graphics, richard armitage and tagged actor, animated gifs, graphics, north & south, richard armitage, richardarmitagenet, richardarmitagenet.com, richardarmitagenetdotcom. Bookmark the permalink. Very poetic welldone Elaine and Bccmee. I loved N&S… and this scene was really beautiful and poetic!!! Good choice Elaine!!! Wonderful vid BCC!!! Thank you both!! It was the first RA work to come to my country. Now we can also see him in Captain America and RH in Netflix. With time, I hope all other series with him will be available. I just knew you’d do something magical with this photo – thanks SO much – it’s stunning! I was in a meeting all morning and just had my first opportunity to look at it – love it! The flash banner is so beautiful …. and those iconic words …. “look back at me”. Cant wait to see how many of his phrases from The Hobbit will become so special too. @Ania: Do you like snow in real life too? I do. 🙂 I’m so glad you enjoyed today’s banner. I like snow in the RL, too 🙂 When gently snows it influences me very calming. As a child I loved to watch the snowflakes and never found two identical. @Ana Cristina: That’s a great story from your childhood. It’s interesting how we try to make sense of the world when we’re young. 🙂 Thanks for sharing! If you looked back that long, you might not only fall to the floor of the carriage but out onto the snowy ground, LOL! Lovely JT! Lovely banner! Lovely choice of picture! @Dhana: Oh thank you so much!!! That scene rates as one of the most romantic on screen. No wonder Richard gained a legion of fans after North & South. Another creative banner Bccmee, biased on Elaine’s perfect choice. Urgh damm my one handed typing while eating b’fast! “based” not biased DOH! @mersguy: Actually the word “biased” kind of fits, since we’re all biased toward Richard Armitage, LOL! 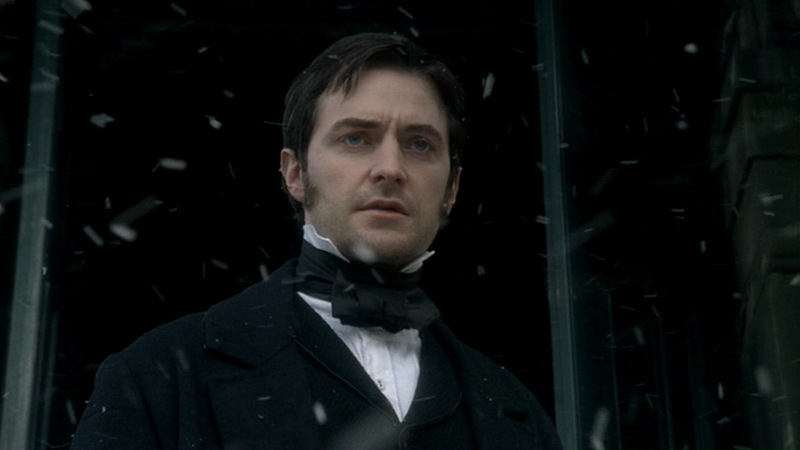 It does not surprise me that Richard Armitage became renowned as a result of his role in North & South. It was such a fantastic work all around. Thanks for your comment! The scene still makes me cry! You intensified the effect beautifully! Great!! @grendel’s mum: It truly is a touching scene. So well-acted! @jeanniegisborne: Thanks very much! Yes, the soundtrack is incredible. I’m glad I learned how to make banners with sound because this music is so lovely. @Thais: It is a stunning photo of a brilliant scene, I agree! Thanks so much for your comment! JT in his most heartfelt unrequited love plea. Sighhhh! Just lovely! @Gratiana: *sigh* He is so sad at this moment, my heart could break. @Joan: Thank you on both counts! You’re very kind to say. Yes, this scene from N&S is incredibly touching. I can see why RA has singled it out for mention. @Tanni Tani: This one is brilliant! I’m including a link on my next blogpost so more people can appreciate your work. 🙂 Thanks!